Information One of our largest branches, the New Glasgow Library is located downtown on the corner of Archimedes & Dalhousie streets (next door to the Fire Station). Small community gardens are located around the library, with a small outdoor community patio. The New Glasgow Library is a wireless hotspot (WIFI) with access to high-speed Internet. Programming, Reader's advisory, reference, Genealogy & Heritage Room, inter-library loan, public Internet access, printer, scanner, 3Dprinter, family play packs, Nordic walking poles, small display area for Public Art, and instructional tours available upon request. A 24-hour return bookdrop is available at the Library entrance. 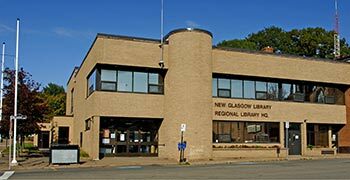 The Pictou-Antigonish Regional Library Board will provide non-profit groups with meeting space free of charge in the Library's Community Room, when not in use for library activities. These meetings are to be of a non-fund raising, non-revenue generating nature. The Board reserves the right to accept or reject requests for the use of meeting space. For more information, please call the library (902-752-8233). The Community Room also has an adjacent kitchenette with limited services. A Community office is also available for reservations. Accessibility Fully Wheelchair Accessible ; The library also provides supported access to the CELA & NNELS audiobook collections for the Visually Impaired & Print Disabled, and has a long-term equipment loan program for DaisyReaders, for library clients. For more information, please contact your local library branch.